Seamus Heaney (1939—2013) is recognized as Ireland's greatest poet since W.B. Yeats. A few days ago, on Friday August 30th, he died in a Dublin hospital. I wrote here, two years ago, in celebration of his most recent poetry collection, Human Chain (2010), particularly of his masterful capturing and preservation of a vanishing way of life. He is the recipient of many awards, including the T.S. Eliot Prize for Poetry for District and Circle (2006). Heaney was raised a Catholic, in County Londonderry, in predominantly Protestant Northern Ireland. In 1972 he resigned from his position at Queen's University in Belfast, and moved to the south. The rural landscapes of his childhood — and of the cottage he and his wife first rented, then owned, in County Wicklow — feature strongly in his poetry. 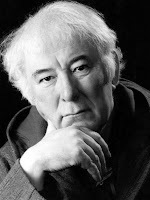 Seamus Heaney will long be remembered as one of the greatest poets of our time. The following poem is the first from his 1996 collection The Spirit Level, published shortly after he won the Nobel Prize for Literature. Then glitter–drizzle, almost breaths of air.